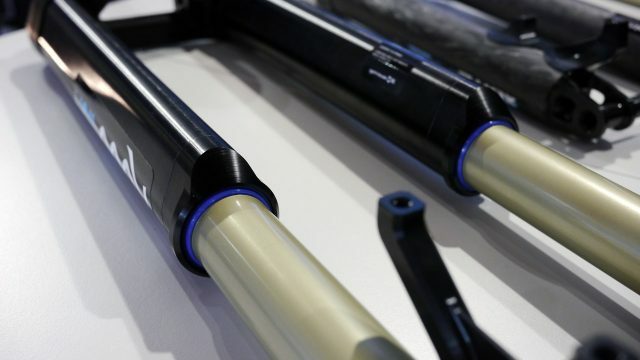 German:A are a company who aim to make the lightest forks they can, and mostly in the past that’s been truss forks, or traditional telescopic forks with as many bits made from carbon fibre as possible. 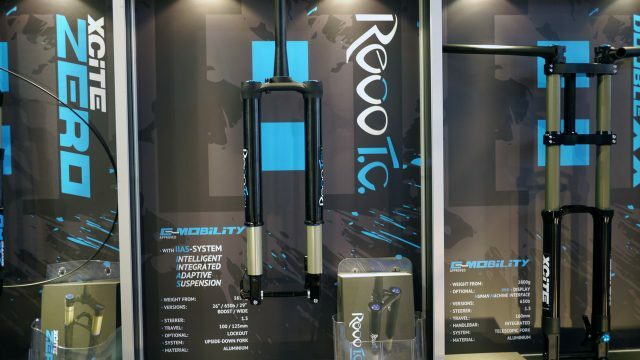 This year at Euro bike they were showing a brand new upside down fork too. 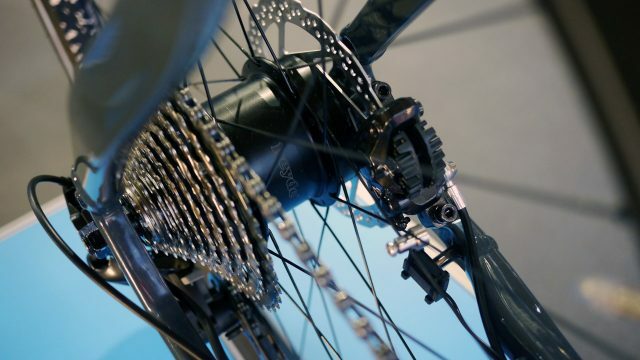 A complaint with some other upside down (USD) forks is that, once the hub is removed, the lower legs can move independently of each other and rotate, making it fiddly to get the wheel back in. 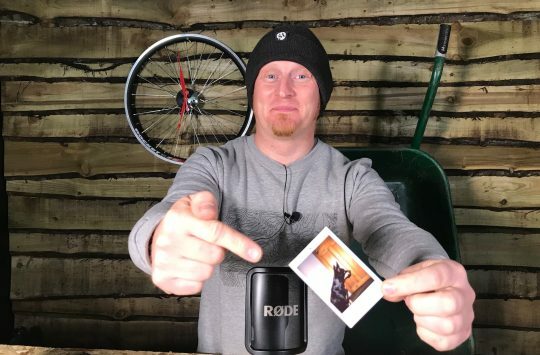 The Revo T.C. solves that with teardrop shaped uppers that the lower legs key to, preventing them from rotating at all. 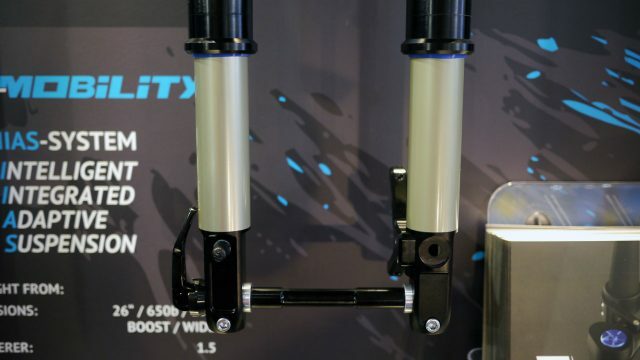 German:A also say they’ve solved torsion problems that can sometimes plague USD designs with the new brace, shown below, which they say takes forces from either leg and pushes them into the other to compensate. It wasn’t entirely clear how just looking at it on the stand, and what was on show bore the telltale lines of a 3D print prototyping. Weight is just over 1650g and travel is 100 or 125mm. 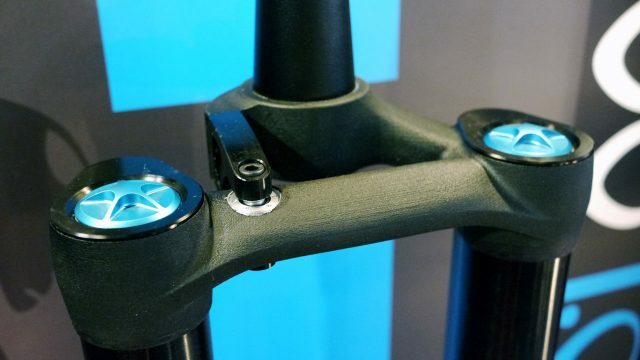 This brace design apparently eliminates a lot of torsional forces on the fork. The teardrop shaped uppers contain keyways that, unlike in some USD designs, prevent the lower legs from spinning and thus keep the axle openings aligned. To go with some of their forks, they were also showing a remote lockout, which German:A forks have lacked until now. 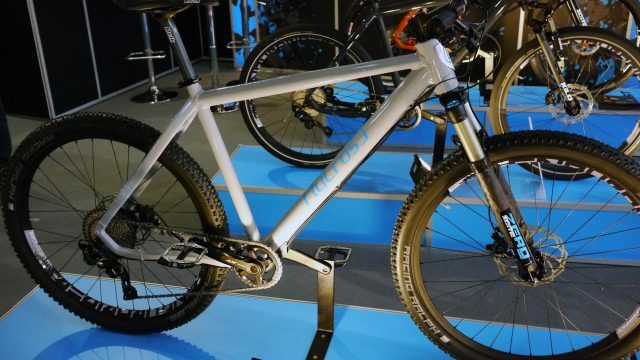 We had a quick play with it on the stand, and it had a chunky, solid, but smooth action. … the flick the lever to unlock it again. 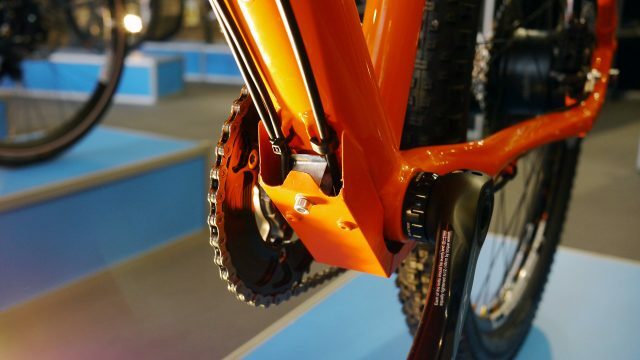 As well as these mountain bike things, much like every other manufacturer at Eurobike, German:A were showing ebikes too, with a few different features to most. 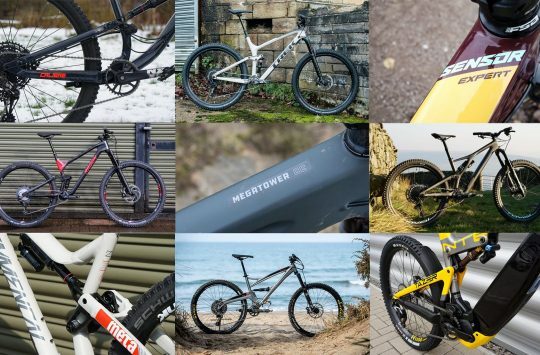 These ebikes were just prototypes for now. For a start, the batteries were not so much non-removable, as only meant to be removed when they’re at the end of their service life. 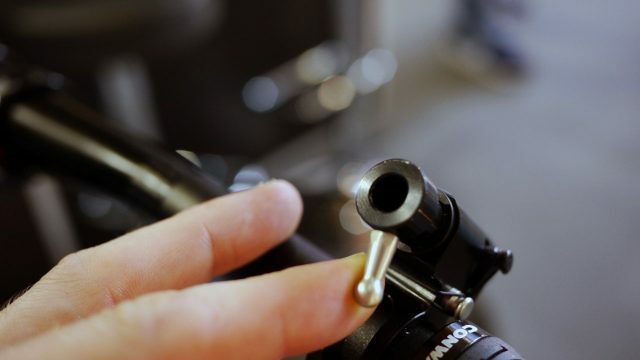 The enormous head badge on each bike also covers the battery post, so when it’s done, you pop the badge off and pull the battery out of the downtube. 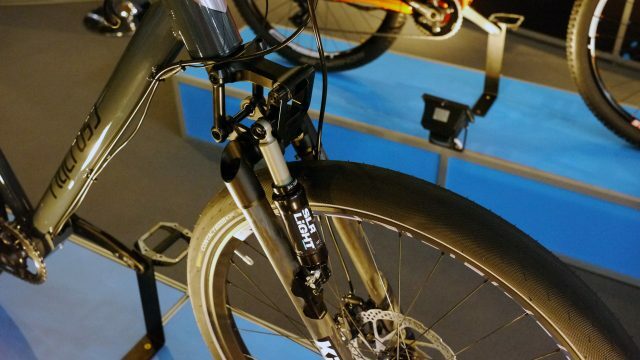 The battery is in the downtube, and is removable once you take that large head badge off. 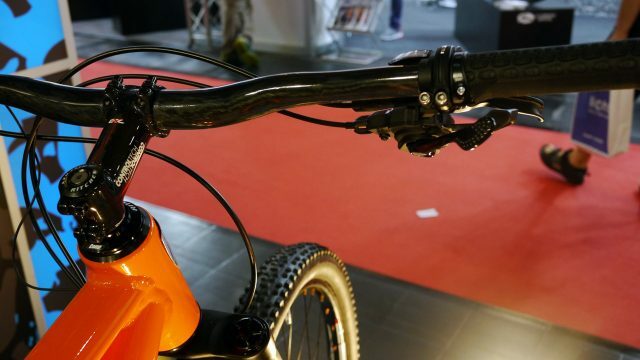 German:A’s ebikes are being developed in collaboration with Keyde. The way it works is apparently by measuring the rider’s cadence, then shifting gears to try and maintain it at a particular speed. 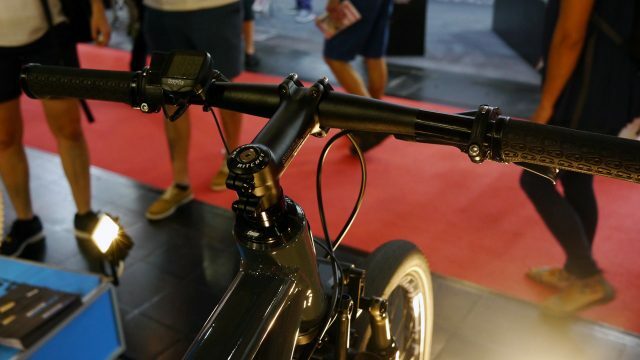 Seems like the kind of thing that’d take a lot of development (or a manual mode) before it’d be usable for technical climbing on a mountain bike, but probably initially suitable for town bikes. We quite surprised to have not seen anything like it sooner. 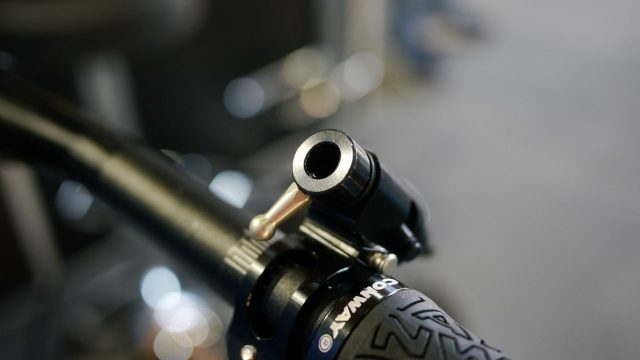 At the bottom bracket end, the downtube has some fairly industrial looking gubbins. … the city bike had all the same M8000, but no shifter! It’s not Di2, it’s cabled, but the cable doesn’t make it up to the handlebars. 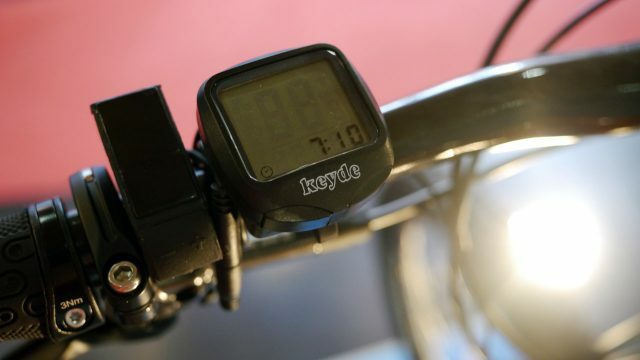 Instead, the bike shifts gears automatically to try and preserve your cadence at a particular rate. We’re curious as to how responsive such an automatic gear shifting system would be, and how well it would handle situations like suddenly hitting a steep slope and needing to downshift. 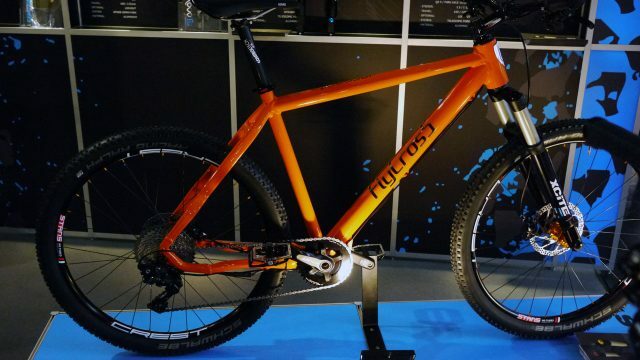 It’s perhaps telling that German:A were showing this on a town bike, but not a mountain bike. 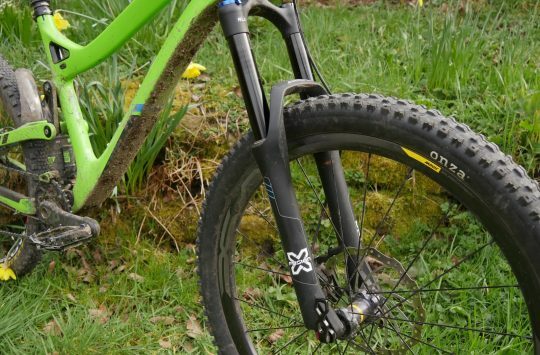 These kind of truss forks might not look more traditional, but they are for German:A. Not a fan of ebikes generally, but at least these are aesthetically better than most out there. USD fork. What’s the benefit?